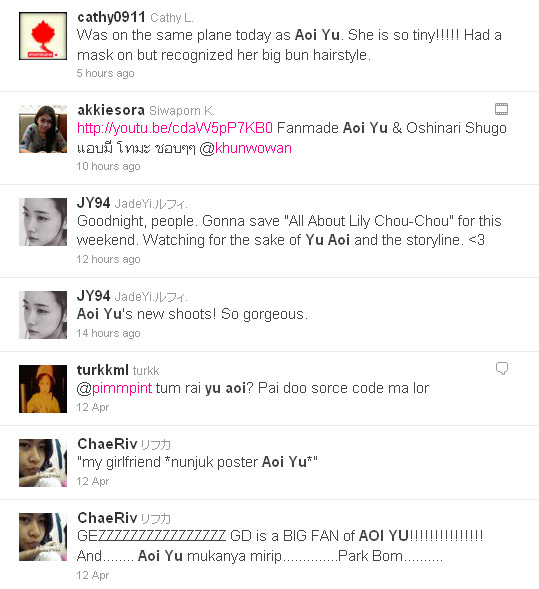 More Yu Aoi Mentions in the Twitterverse | personal.amy-wong.com - A Blog by Amy Wong. Also… did you read what Cathy tweeted? She was on the same plane as Yu-chan (apparently) xD Amazing that she could know just by her upward hair-bun. Obviously, I’m jealous… in a very stalkery way. Don’t worry, even if I had been in that plane… I wouldn’t have dared to do anything. In my opinion, it could be more like Bom mixed with Sandara. It hurts to admit, but… from certain angles – yeah, I could see the resemblance. I still think she is more like Sandara though.